Come and Support SHN at the Wellesbourne Street Fayre this Saturday 12.30 – 4pm come and enjoy a fun day out in the June Sunshine!! There will be a flower show in the church along with a display about the Coronation in 1953. There will also be a display of children’s work from the school. There will be food available from a farm stall selling bacon and sausage baps and cream teas in the church rooms. We will also have a crepe van on the street and ice-cream seller. Lots of local businesses are supporting the day. We need you to support this Street Fayre by coming along. 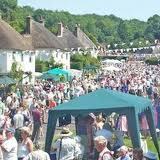 This is a great village event. Remember proceeds go to Shipston Home Nursing.